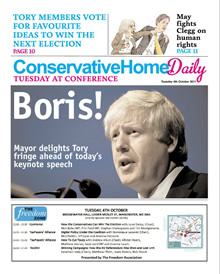 Following the launch and success of the ConservativeHome Daily at Autumn Party Conference 2011, we are delighted to announce we will be distributing our conference newspaper again in Birmingham for 2012, starting with Edition one on Sunday 7th October and last edition Wednesday 10th October. 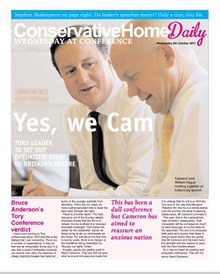 The full colour newspaper will be new each morning with a changing colour masthead, printed overnight and 5,000 copies distributed each morning of the Tory Conference at key hotels, fringe meetings and outside the International Convention Centre. Once again, as well as including conference commentary, summaries of the overnight news, reviews and contributions from key political speakers, there will be a few dedicated pages to advertising in each edition, please see below. (Key contributors last year were Cabinet ministers, rising bankbench MPs and leading journalists). Our prices are flexible and we have a creative designer who can help produce a visually interesting presentation of your message. Prices are excluding VAT. 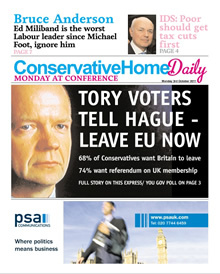 All adverts are subject to final approval by ConservativeHome. 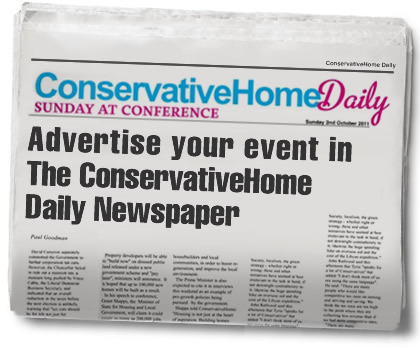 If you are keen to advertise your fringe event, book launch, campaign etc. please email Michelle to reserve your space, stating size and date(s). Full dimensions and formats will be emailed at a later date. 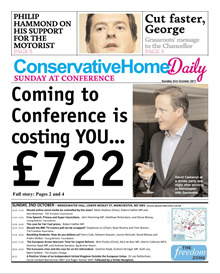 Previous editions of the conference newspapers are available to read online.